Little Nyasebit, seems to be uncomfortable with her new, artificial leg.She is only 8 years old and undoubtedly different that the other girls of her age as she was shot by unknown men few months ago in her own house and later amputated. 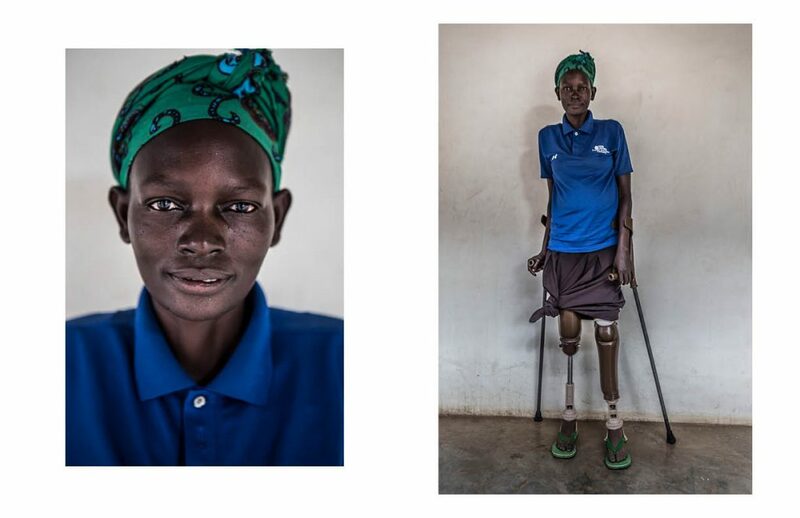 Despite this tragic event, she is one of the lucky ones as she is again able to stand on her two feet again with the help of the prosthesis made in the Physical Rehabilitation and Reference Centre in Juba, South Sudan. “She doesn’t like her artificial leg, it’s normal, she’s a child. When she’ll be older she will understand how important it is for her life.” Oketta Robert Kanyara, one of the physiotherapists, says. “I got bitten by a snake. 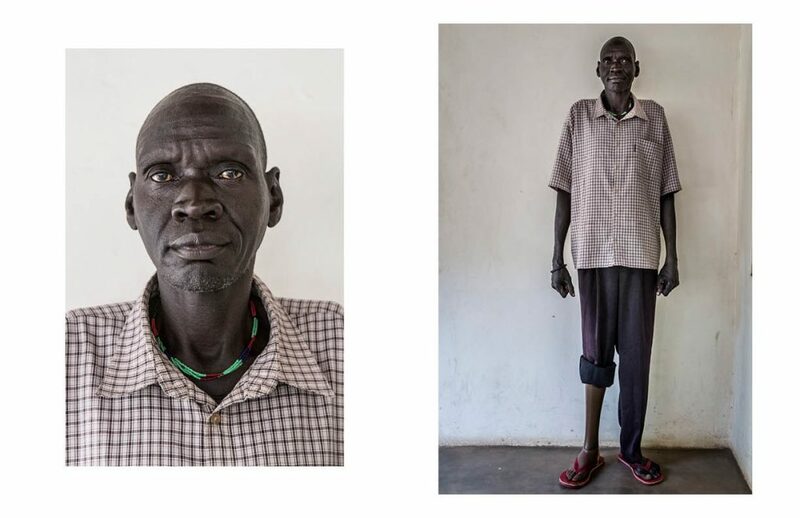 By the time I went to the hospital the infection was that severe that the doctors had to amputate twice my leg” Bol Nyang is a 29 year old South Sudanese man who had his leg amputated in 2012 tells. It took another 6 years until he got his first prosthesis. 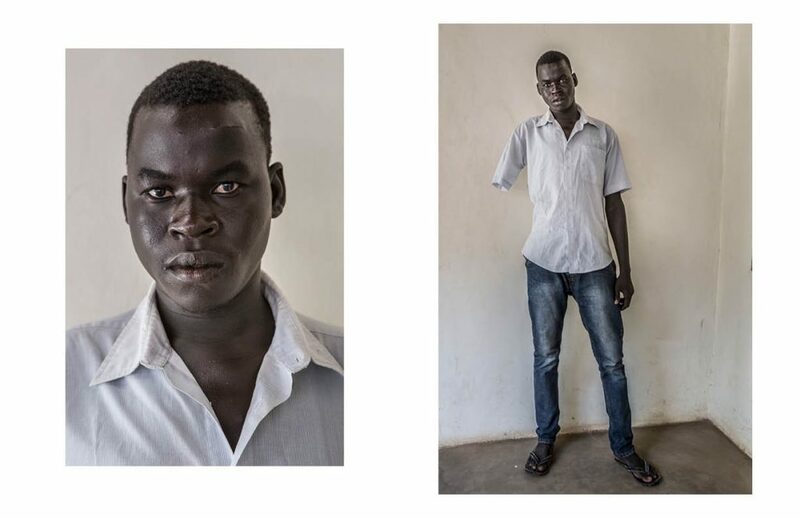 Now he’s staying in the rehabilitation centre in Juba which is run by the South Sudanese government and the International Committee of the Red Cross (ICRC), the biggest centre for prosthetic orthotic treatment in the country. 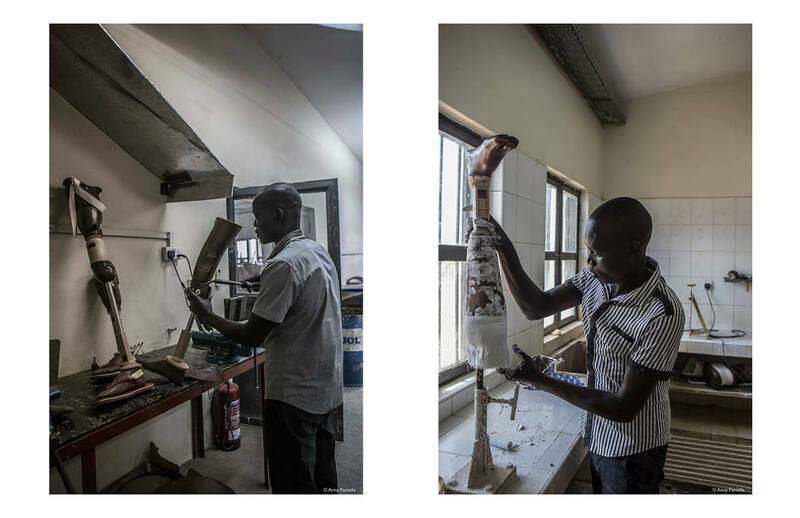 Patients there receive hand-crafted, custom fit artificial limbs and orthotic devices made within the centre. The whole procedure takes a few weeks and includes physiotherapy and further training on walking with the new limbs. 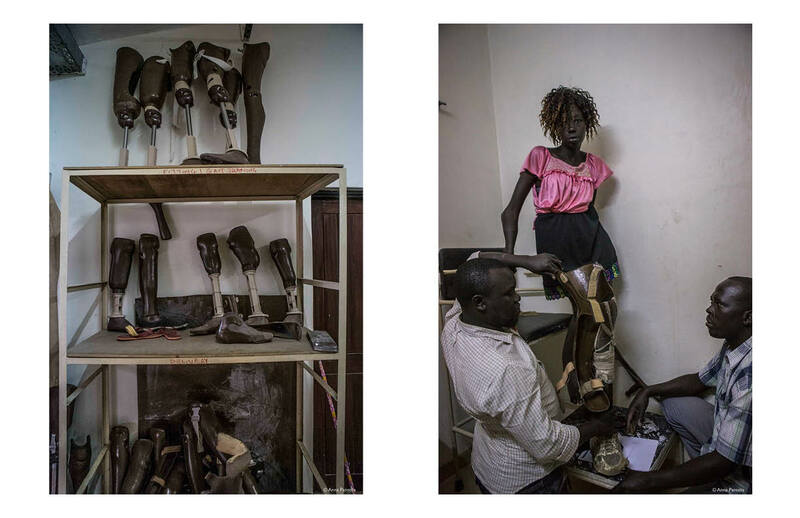 “The prostheses can be made within a day and the patients need anywhere between 2-3 weeks to start walking depending on the nature of the trauma.” Oketta Robert Kanyara says. However, due to very limited infrastructure getting to Juba is too expensive and difficult for most amputees. 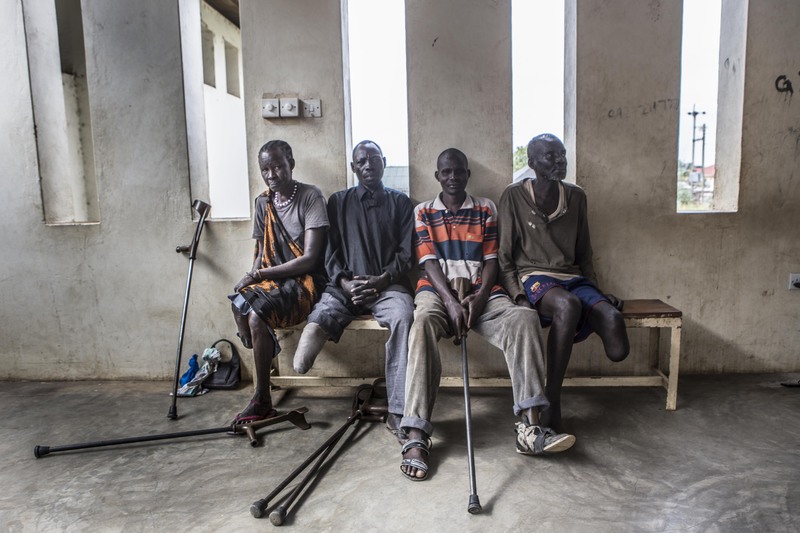 For the past 10 years, the ICRC has been facilitating the access of patients to the service by providing air transportation from different parts of the country to Juba, Wau or Rumbek, where ICRC runs physical rehabilitation services. For patients coming from other cities to get their treatment, accommodation and food is provided within the centre. 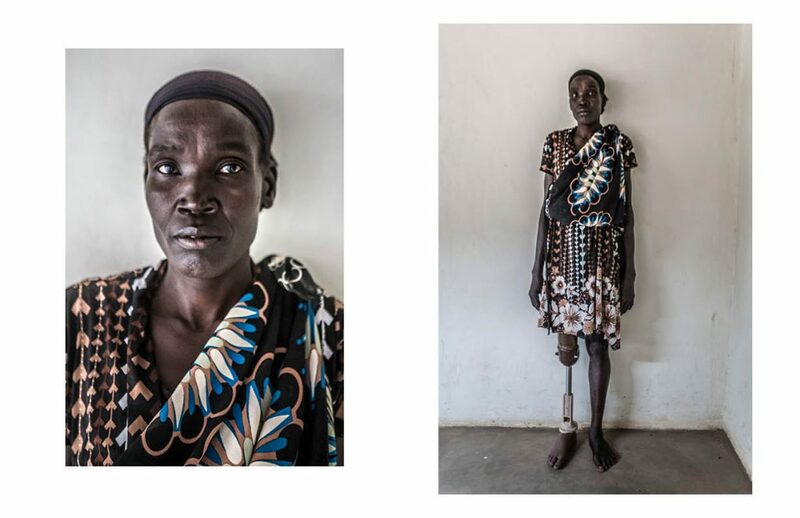 Nyasebit is just one of the thousands victims who survived an attack of past and current conflict in South Sudan. It’s been only 7 years since South Sudan became independent from Sudan and the world’s youngest country is still struggling to stand on its own feet. The ongoing civil war which followed independence stills devastates the country. 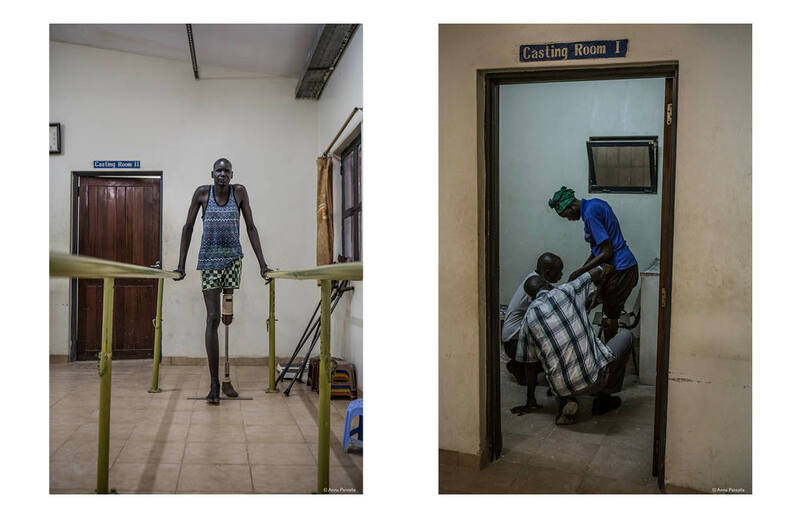 The effects of that war will never fade for South Sudan’s amputees, most of whom lost limbs as a result of the conflict, but some light is appearing at end of the tunnel. 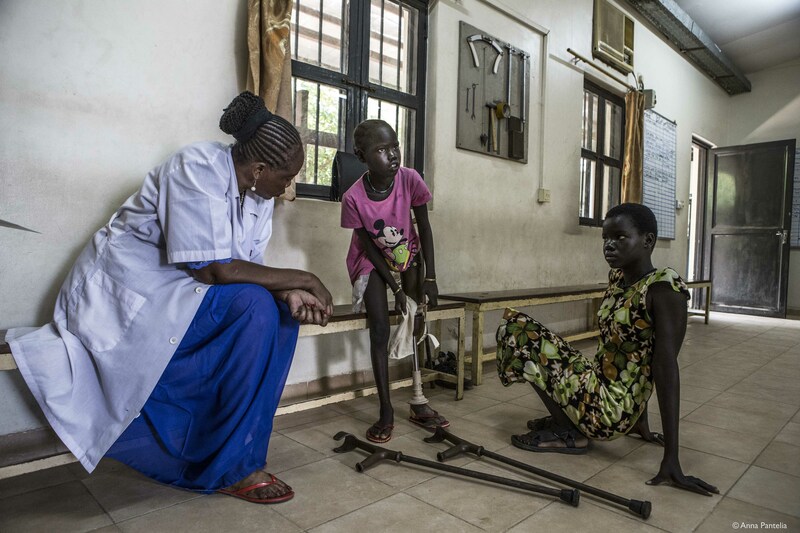 One of the brightest examples is Charity Araba who lost both of her legs twenty years ago after a landmine explosion used during the war between Sudan and South Sudan. 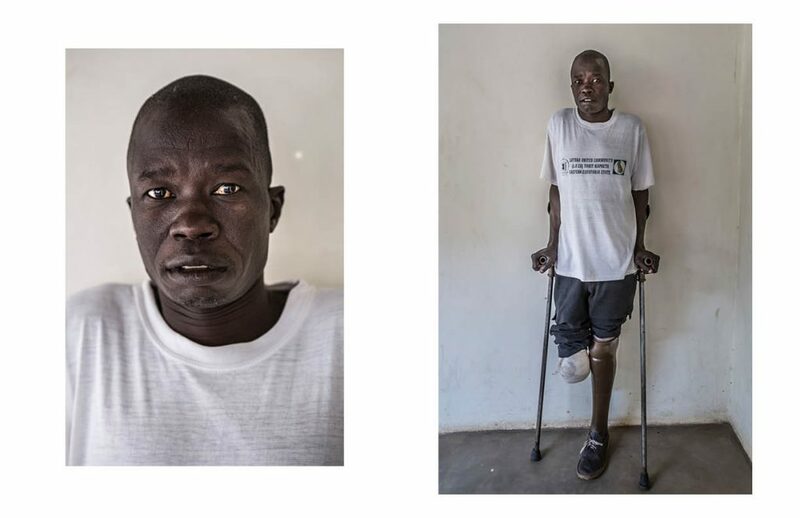 “When I stepped on the landmine I felt it was something wrong. I asked for help and the rest came over to help me. Once they lifted me the landmine exploded. All 8 of them died during the explosion. I am the only one who survived and I was even three months pregnant.” She recalls vividly. After the amputation, she still managed to birth to her child but she couldn’t recover from her psychological trauma caused by this brutal event. “At the beginning I was depressed. I lost my legs and my husband was killed in the war. After the amputation I lost all my hope, so did my family.” she continues. Similar is the story of Madalena Abuya, a 51 year old woman who was shot when she was a child. “During the war [before independence from Sudan] soldiers entered my house and started shooting. I don’t remember how old I was back then but I was very young. I was shot and then amputated. My parents were also killed during the war so I grew up with my siblings. My husband has also died in recent conflicts in Juba in 2016. Now I have 5 children who I take care of myself.” she recalls. Madalena received her first artificial leg 17 years ago. It’s only a few months since 8 year old Nyasebit Jial lost her leg. A group of unknown men stormed into her house and shot her in the leg. Nyasebit used to live with her family in Bentiu, about 654 kilometres northwest of Juba, the capital of South Sudan. After the incident her parents fled Bentiu and she along with her elder sister have been living with their aunt in the protection of civilians’ site (PoC) of the UN in Bentiu. “I had my own business in Bentiu. I got a snakebite and then my leg got infected and they had to amputate it. I was amputated twice because of this. I got bitten around the evening but I only managed to go to the hospital the next morning. 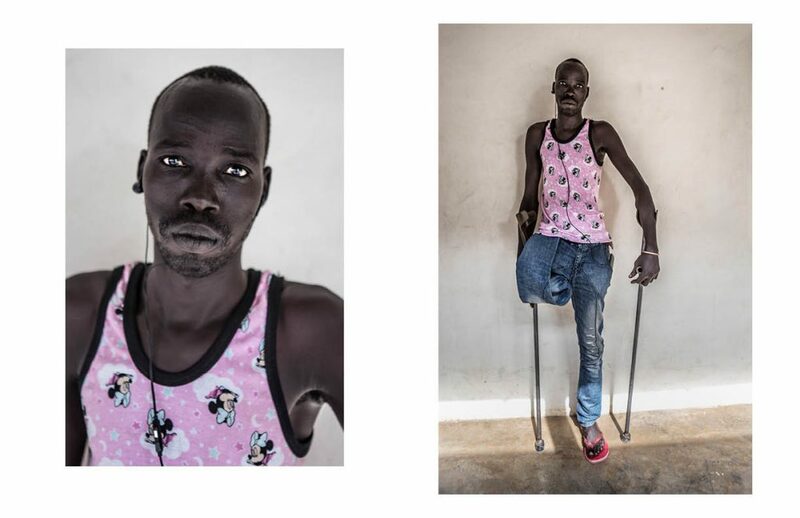 It was already too late.” Bol Nyang is a 29 year old South Sudanese man who had his leg amputated in 2012. After 6 years since the incident he can now again stand unsupported. “The artificial leg makes my life easier. Now that I don’t have to use the crutches I am more independent as I can use my hands and I can do more activities. I can run my shop again and I am even thinking to expand my business!” he says proudly. Bol is not only recovering in the Physical Rehabilitation and Reference Center but he also spends time with the social worker empowering and motivating other amputees. “During the war [before independence from Sudan] soldiers entered my house and started shooting. I don’t remember how old I was back then but I was very young. I was shot and then amputated. My parents were also killed during the war so I grew up with my siblings. My husband has also died in recent conflicts in Juba in 2016. Now I have 5 children who I take care of myself.” Madalena Abuya, a 51 year old woman recalls. Madalena is cultivating around her house in order to provide her children some food. She received her first artificial leg 17 years ago. Since then she is more independent as she doesn’t need to use the crutches anymore but she is still unable to cultivate enough to be able to sell crops and make some profit. “The incident happened in 2015 in a village called Tirragore. It was a gunshot. There was intertribal conflict. I was in the bush grazing cattle and someone shot me and some other people. Later I was taken to the hospital where they had to amputate my arm. The bullet cut my vein from the shoulder so my arm got paralyzed. In this area villages were in conflict with each other. Even until today it’s not safe there. Now I am still trying to finish the secondary school and I want to become a lawyer.” Omuta Justine Osfaldo is a 23 year-old man from Tirrangore area. “The incident happened because my elder brother was a soldier. At some point him and 3 of his colleagues got ambushed in Torit. All of his colleagues were killed on the spot but my brother survived but he was shot 3 times. One family member of my brother’s colleague came and shot me as revenge because his relative died while my brother was still alive. This happened in 2000 when I was about 15 years old. In 2001 I fled in Kenya as refugee but in 2008 that things were calmer in South Sudan I came back to finish my school. 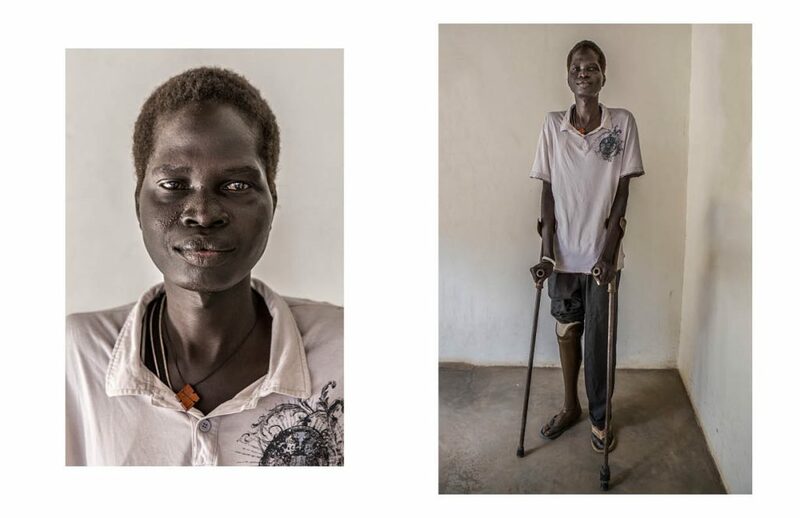 Now I take care of my family but I also take care of my other’s brother family who got killed during the conflict.” Gilasio Odong is 33 years old amputee from Torit, a town located 150 km east of Juba. 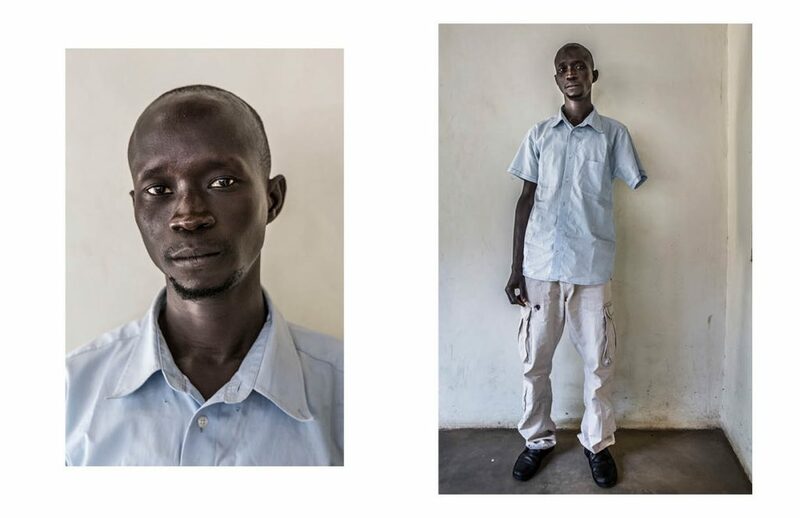 He had his arm amputated 18 years ago after he was shot in a revenge attack. 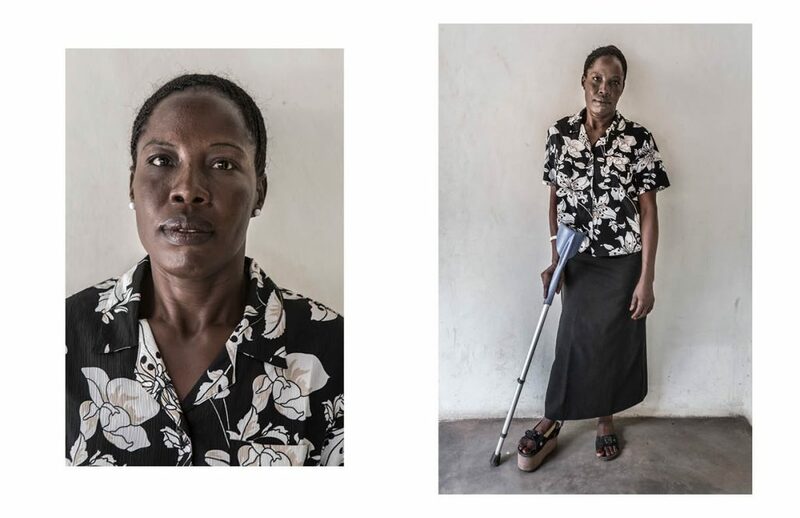 Suzan Ide is a 40 year old single mother who suffers from polio. One of her legs is deformed due to the disease but despite the odds she runs her own small business, she helps and empowers other women and is an activist. She provides housekeeping services to the Physical Rehabilitation Centre in Juba run by the South Sudanese government and the ICRC. She also employs other single mothers and women with special needs. “ I want to help single mothers and mothers with disabilities so they can educate their children. I want them to be independent and self-reliant. In 2014 I went also to the rehabilitation centre in Rumbek where I trained more women to run the same project. 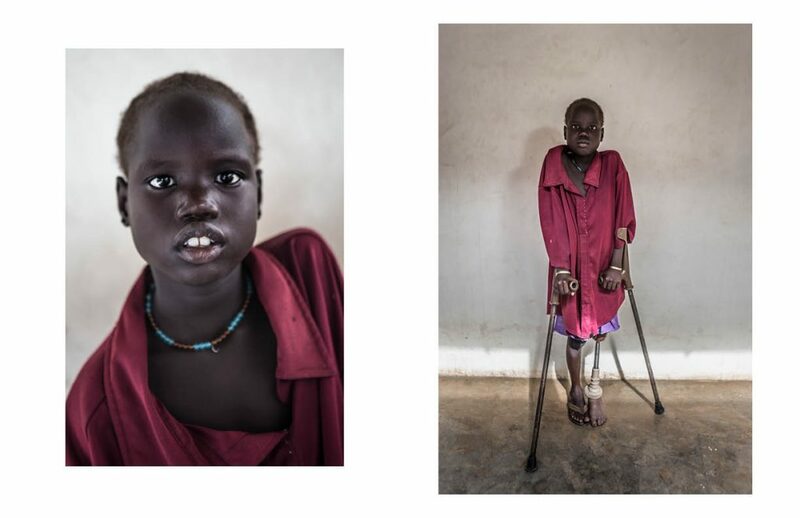 Disability is not inability so I want to show that everyone can learn from our example and understand that we can do everything we want.” According to Suzan, some remote places in South Sudan the society marginalize women and children with disabilities. “Most of women with disabilities are single mothers as they are usually abandoned by their husbands. Extended families didn’t support marriages of disabled women.” Her dream is to open a school that will provide education to all disabled people and not isolate them from the society. During the recent fighting in 2017, Santo Ngor Kot was a soldier. He was shot and had a leg amputated. 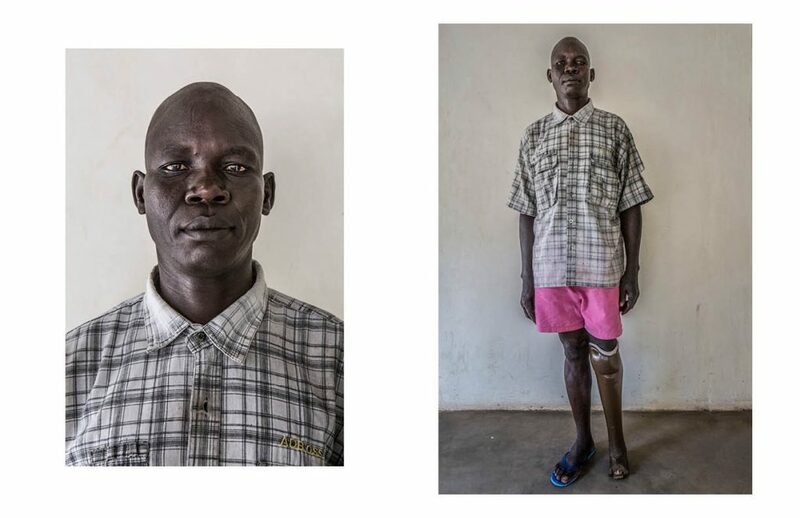 He is now in the Physical Rehabilitation and Reference Centre in Juba where he received his artificial leg and with the help of the physiotherapists learned how to walk again. It’s been 30 years since Micheal Hook Gome lost his leg but he vividly remembers the day. He was a child soldier when he got shot. The wound was so bad that the doctors were finally forced to amputate his leg. “After the incident, I wanted to study and I started studying law but due to my financial situation I had to give up my studies” he said. His only hope was to be able to support his wife and children as much as he can. His artificial leg has allowed him to cultivate enough so the family has some food to eat. Joseph Kanuto is a 35 year old double amputatee. In 1996, during the war, he stepped on a landmine which exploded and lost both of his legs. “We were 6 people together and only 2 survived, three of them were my friends.” He now has to take care of 10 children and 2 women while he runs a small shop in Magwi, a small town 140 kilometres southeast of Juba. “My life is very difficult, I manage to buy some goats and cows but if I had my legs I would do much more than this.” He says. However he admits that the artificial leg has gave him much more independence as he doesn’t need to use the crutches anymore.